Dometic universal standard 8' projection replacement awning fabric for your Carefree and Dometic A&E awnings are made of vinyl and available in several colors and sizes. The awning fabric is double sided with a built-in straight valance and is easy to install. To find your awning replacement size take a measurement from the center of the left side awning arm to the center of the right side awning arm. DO NOT TAKE a measurement of the actual awning fabric. Fabric size is determined by center of arm to center of arm measurement ONLY. When taking your measurement to determine your awnings size, you will act like the fabric is already removed, DO NOT even pay attention to it. You are measuring the center to center (middle of left arm to middle of right arm) distance between your arms, you are NOT measuring your fabric. Traveling in an RV offers adventurers a home away from home. Where you can relax outside in a lawn chair under your awning for comfort and shade. When an unexpected wind gust rips your awning fabric where are you to go to replace it? You have found the right place! 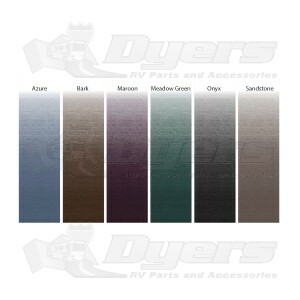 At Dyers we carry replacement awning fabrics for two of the most popular awnings, Carefree and Dometic. The Dometic replacement awning fabric is made out of a durable double sided vinyl. The double-sided vinyl is 13.5 gauge, which is thicker than your standard 11.5 gauge single-sided fabric. It arrives to your door ready to install. Dometic added a built in straight valance to give the replacement fabric that extra touch of class. With a poly rope pre-sewn into the fabric, installation into the track is easy. We also include the installation instructions for your new replacement awning fabric. Whether you are replacing old, worn, torn fabric or you just fancy changing the color of your current awning fabric our low prices and quick shipping time makes the Dometic awning replacement fabric a great choice! To find awning size take a measurement from center awning arm to center of awning arm. DO NOT TAKE a measurement of the actual awning fabric. Fabric size is determined by center of arm to center of arm measurement ONLY. When inquiring if the Dometic replacement awning fabric is right for your Dometic or Carefree awning please have the model number of your current awning available when speaking to your customer service representative. SHIPPING NOTES: Awning fabrics ship rolled depthwise. They will arrive in an 8' tube so there are no creases from folding and also so there is no need to remove the fabric from the packaging if you do not want to install it right away. No matter what size awning you order, it will always arrive rolled depthwise in an 8' tube. Please do not mistake this for us sending only an 8' awning and panicking that it is the wrong size. This is done so that your awning is not folded and subject to crease lines. Color Codes: NU Bark replaces EA Fawn, NT Azure replaces GF Sky Blue, NW Meadow Green replaces GJ Sea Green, NV Maroon replaces HF Maroon, NS Sandstone replaces GL Driftwood, NR Onyx replaces both EH Pewter and GN Granite. One piece fabric fits both Carefree and Dometic A&E Awnings. ** Does not fit awnings WITH a metal Weathershield. ** Not compatible with a model 8500HL (HI-LOW) series awning. Poly rope pre-installed - which means faster and easier installation. - These fabrics are for the standard 8' projection. Very nice awning. Love the color. The instructions on ordering were easy to follow and resulted in a perfect fit. Good price. Wish it had included a matching pull cord. We were impressed with the awning fabric seems very well made. Love our color choice. The install instructions include any possible repair for your awning, so we found this a bit confusing, but nothing a quick utube search didn't remedy, then we went back to the written instructions and they made a lot more sense to us. Looks and works great, looking forward to camping this summer. This was a lot easier to install than anticipated. My "helper" only needed when pulling the top cord from RV rail and back on again. The underside of the fabric matches the top printed side where the old Dometic awning fabric had a white underside (reflected light better). The fit and quality of this fabric is excellent- shipped and received exactly as stated - oh even a day early ! The material the awning fabric is made out of is at least as heavy as the original. We ordered the Sandstone version and my wife and I are both extremely happy with how it looks! The installation took about two hours and was not all that difficult. I recommend watching a couple of installation videos on Youtube so you know what you're supposed to be doing.